The son of a cemetery’s keeper has his work cut out for him by a vengeful witch who raises all the local dead at once—and threatens worse. The whole episode turns out to be a family quarrel writ large. 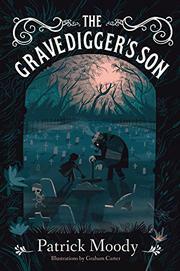 The latest in a 1,000-year line of Gravediggers tasked not only with interring the dead, but dealing with any last requests their restless spirits might have, 11-year-old Ian would rather be studying herbal medicine than learning the family trade. Tricked into venturing down the forbidden Pumpkin Trail—a dark woodland path lined with jack-o’-lanterns—he falls into the clutches of three not entirely unfriendly young witches (called Weavers) and their sinister grandmother Dehlia. With help from Bertrum, his fierce if somewhat raggedy zombie guard/tutor (a scene stealer if ever there was one), Ian escapes…but not before giving up a smoking potion of blood and bone to Dehlia that raises thousands of bewildered corpses in the cemetery. Luckily, Ian has many generations of predecessors to call on to help re-lay the dead, and Dehlia needs only doses of empathy from him and his long-dead mother, a Weaver herself, to give over her scheme. Aside from the olive- or dark-skinned Weavers, the cast presents as white, and Carter follows suit in occasional mildly gothic illustrations.